The Blaze Professional 3-burner Natural Gas Grill With Rear Infrared Burner comes strong with this offering. 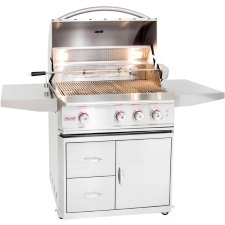 Talk about heavy-duty, this grill provides 54,000 BTU’s via cast, stainless-steel H-burners on top of 12mm hexagon, cooking rods which provide the lucky grill-master with amazing searing temperatures. A generous 615 square inches of cooking space, this grill also features a 10,000 BTU infrared burner in the back where the slow-roasting of meat and fruit can cook in unison. Best of all, once you’re done grilling, the slide out drip tray literally falls out on rollers as smooth as a baby’s bottom. Dump the junk, and that’s that. A grill that has thought of everything! The burners on the Blaze Professional Natural Gas Grill are some of the most industrial burners you will find on a commercial grill. You might be thinking, “but I don’t want industrial burners.” But these aren’t your ordinary industrial burners, they were fabricated for the backyard griller in mind, cast stainless-steel delivering extraordinary heat distribution over 18,000 impressive BTU’s. The burners are boss, but the grids on the Blaze Professional 3-burner Natural Gas Grill are fit for a King. Thick and hexagonal in nature, these 12mm cooking grids are some of the heaviest you will find. This equates to bigger and better sear marks which will also give your food faster heat recovery after you’ve flipped it. You never thought so much thought went into grids, did you? Heat zone separators giving you the option of cooking an array of food simultaneously utilizing distinct temperatures. Hexagon cooking rods made from cast stainless-steel which are extra thick for all-purpose searing. Massive, 12 gauge stabilizing grids that minimize nasty flare-ups. Lifetime warranty (best in class) . Red LED lights on the grill knobs. At the time of this writing, there are 3 customer reviews on Amazon sharing their thoughts on the grill as well. Those who have bought and used the grill give it a 4.0 out of 5 stars. In summary, the Blaze Professional 3-burner Natural Gas Grill with cart is an industrial grill disguised as a backyard weekend warrior. This is great if you indeed are a backyard weekend warrior, but if you are only grilling a handful of times a month, this is probably not the grill for you. Not to mention the cost, it’s a bit pricey. But all in all, a solid grill.